Now that you have entered giveaway #1 and giveaway #2, here is giveaway #3 from the Back to School Givaway Bonanza. These screen printed posters make a beautiful addition to a playroom or classroom. And A Modern Eden has graciously supplied a $106 Gift Pack to one LRWC lucky winner. Required Entry # 1: Place a comment below stating which you like the best. You can check them out here. Bonus Entry #2: You can earn a second entry by following LRWC on Facebook. If you are already following, just leave a comment stating that. Bonus Entry #3: You can earn a third entry by following A Modern Eden on Facebook. Leave a comment once you have “liked” A Modern Eden. The giveaway ends at 11:59 pm EST on Friday 8/13 /10. No entries will be counted after that time frame. Winner will be notified within 48 hours of the giveaway ending via email. Winner must respond with mailing address within 72 hours or another winner will be chosen. A big thank you to A Modern Eden for providing this great gift pack. LRWC was provided with a gift pack for review. The opinions contained in this post are that of LRWC and were not in any way influenced by a Modern Eden or an other party. You can view the official terms of this giveaway on our Facebook page. I like the bright colors and cute designs. Love all the posters. But my son would like the lion one. Thanks! Already following you (and loving it) on Facebook. The lion is really cute. I follow both on FB already. This is great stuff. These would be great in my first classroom this fall!! How cute! Would Love to win…The peacock tote is soooo cute! This is great stuff…I love how the flash cards can be showcased as art work. I love the apple tote. The flashcards are great too! I follow “A Modern Eden” on Facebook. I love the Webster the frog poster. So cute! I “like” a modern eden on facebook. I like the apple tote! I love the apple pattern! Liked A Modern Eden on fb! I really love the apple tote! I love totes. I practically collect cool designs – and I love the tree design. I fllow LRWC on FB. I follow a Modern Eden on FB. I like the tree tote, but the frog poster is my fave! I like the flash cards! A new twist on a proven idea. LRWC facebook fan as well. I like the tree tote best and would love to use these products with my 3-year-old son! We home-school, and I think these products are fabulous! I love the peacock poster & the apple cotton tote. I’m a LRWC Facebook fan! I like the tree tote. Cute color scheme! How cute! My daughter would love this. I follow LRWC on Facebook too!!! I LOVE, LOVE, LOVE, Presley the peacock poster!! Need that for the laundry room! I love Webster the Frog, he is so regal!! I am a follower of LWRC on Facebook. I also am following A Modern Eden. Thanks!! I love the phone app. Too cute! I love frogs; so i love the frog design. I follow A Modern Eden on Facebook. I love the posters. They would be perfect for our playroom! The tree icon tote is adorable! i really like the animal flashcards and the Peacock is super cute! I like the Tree Icon Cotton Tote Bag best! I love the colors and bright graphics, the Owls and frogs are adorable. I am a fan of your website and A Modern Eden. These would look great in my office and then my classroom. I like A Modern Eden on facebook! i like the Presley the Peacock Poster. I would like it in a tote even more! I really like how they do a variety of things from apps to flashcards to totes and free images for your phones, etc. But I really like the lion poster! I am a fan of A modern eden. I love the frog, he’s so cute! I “liked” Modern Eden on facebook . I like the tree lined cotton tote, just looks cool. I also like the apple tote. I’m a sucker for totes! We are fans on fb of LRWC & A Modern Eden…. I like the Peacock poster!! I follow LRWC on facebook. I follow Eden on Facebook! 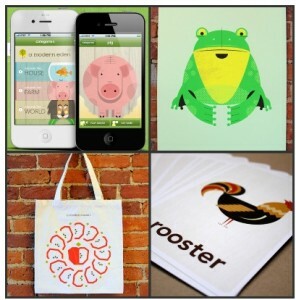 I like the C is for Cow flashcards for my daughter or the apple cotton tote bag for me! The screen printed posters look neat. I liked the Henry the Lion poster the best. I am already following LRWC. I liked A Modern Eden on Facebook. i really like the animal flashcards! I like the animal flashcards. I like the tree lined cotton tote and I also like the apple tote. I use totes for everything. I would love to have the screen printed posters! i like the tree totes! perfect! I like A Modern Eden on fb too! I love the peacock poster! I am a fan of A Modern Eden on Facebook! the apple cotton tote is my favorite! Hi I love it all. I will take any help that I can get to keep my two little ones intersted in learning. I follow LWRC on Facebook. I also follow A Modern Even on Facebook. I like the apple tote. I love the tote bags and the animal cards and the postcards! Following you on FB, too. I like the tree tote! I “like” Living Rich with Coupons on facebook. I became a fan of Living Rich with Coupons on facebook. I became a fan of Modern Eden on facebook. Love the iphone app. Thank you. Like you on Facebook. Thank you. would love the flashcards for my preschooler! I follow LRWC of facebook. I love there flash cards! I like the flashcards the best!! I like the Henry the Lion poster. I like the frog poster! Too cute! I like Modern Eden on FB too. I love the Henry the Lion poster. I “like” Living Rich with Coupons on FB. I “like” A Modern Eden on FB. I really like the lion poster. I follow LRWC on FB! I follow Modern Eden on FB! Facebook fan of Modern Era. I like the colourful label sets!! This sounds great! I’m especially interested in the iPhone app. I think my daughter would love it! I m a modern eden’s fan on facebook! I am a fan of A Modern Eden on FB! I love the Tree icon tote! I like Modern Eden on fb! I “like” LRWC on FB. Would love it! I follow you on facebook and love your hints to shopping at Shoprite! I love the apple cotton tote! following A Modern Eden on Facebook! I follow on fb!! Love the flashcards!!! I’m already a fan of YOU on facebook, and I subscribe! I like your blog…I’d love to gift my granddaughter pink Dell! I love the apple tote! I like the flashcards and I like the peacock poster. I follow Modern Eden on Facebook. I love the peacock. It’s beautiful. I like Living Rich on FB. My son would LOVE the frog! I follow living rich with coupons on facebook. Tree Icon Cotton Tote Bag – LOVE IT! I like the Lion Poster from A Modern Eden. I like LRWC on Facebook. I like A Modern Eden on Facebook. I like the Tree Icon Cotton Tote Bag. I “Like” LRWC on Facebook! The apple tote bag would make a terrific teacher gift. I like the peacock tote. I love, love, love Henry the Lion! I live the flashcards but all would be a great addition to our homeschool. I like the tote bag best! I follow LRWC on facebook! I am a fan of Modern Eden on Facebook. I like the flashcards and the apple tote the best! I like the totebag with apples best! I like the Webster the Frog poster the best! This is so cute! I love the tote bag! I love that these are different then what you normally find! Love the lion and peacock posters! I adore the apple tote bag. I like the frog poster. I like the apple cotton tote bag! I love the Animal Flash Cards!! Love the kids crocband snnek! But I would LOVE to have any crocs! I heart crocs!!!! I love the Presley the Peacock poster. I like the presley peacock poster. I love the lion poster! I like LRWC on FB! I really like the tree tote bag! A girl can never have too many bags! I already like you on Facebook and follow via rss. I also like Modern Eden on Facebook! I follow modern ed on facebook You are posting comments too quickly. Slow down. Henry the Lion is darn cute. I like Webster the Frog. He is so cute! i like the tote bags. i am a fan of LRWC on facebook. I am a fan of A Modern Eden on facebook. I am following LRWC on FB. I am following a Modern Eden on FB. Love the apple tote bag and Henry the Lion! I like the tree tote the best. I follow LRWC on facbook and love it. I “liked” a modern eden. The apple tote is my favorite. I really like the animal flash cards. I following A Modern Eden on Facebook. I like the lion print! I like the apple. Thanks! I like the aplple – tote…very cute! I also follow you on facebook. Love the flashcards, and the “Piggy Speaks” app! I like the “Apple Cotton Tote Bag”. Normally, I would choose the tree but this one kind of looks busy. I love the Henry the Lion! I like the flashcards the best, but the posters would be beautiful in my children’s playroom! I “like” A Modern Eden on Facebook as well! I love the Henry the Lion poster! I already follow LRWC on FB. I really like the Henry the Lion poster, but I think my girls would love the apps! I love the animal flashcards! I like the tree design on the tote. I follow Moern Eden on fb. I like the animal flashcards!! Big fan of LRWC on facebook. The animal flashcards would be really good for my 2 year old daughter. i follow modern eden on facebook too. I like the animal flash cards. They are very cute. I “like” LRWC on FB! I “like” A Modern Eden on fb! I love Henry the Lion poster! So cute. I follow A Modern Eden on fb! I adore the “C” is For Cow App and the flash cards! They feature the cutest pigs! the lion poster is fabulous! I like the flashcards the best. I “liked” A Modern Eden on facebook. “Apple cotton tote bag” because I like how the red color in the apple pops out. how upbeat and cheerful the animal flashcards are. That is my pick! I would give this as a gift to my nephew…due in sept!! I like the animal flashcards would be great for my in home childcare. I follow LRWC and A Modern Eden on Facebook. I absolutely LOVE the Apple Cotton Tote bag! It can be used as a shopping bag, as a diaper bag and a pool/beach bag! i like the flashcards. think it’s interesting that they are textured…it seems kids learn better the more senses you incorporate into learning. The animal flashcards would be great. The kids would love them. I followed LRWC on Facebook. I LIKE M.E on facebook! I’m following Modern EDen on fb. I follow LRWC on fb. I like Henry the Lion. I follow AME on FB. I love the animal flash cards! I like A Modern Eden. I like the apple cotton tote bag. I am a fan of Modern Eden on FB! I am fan of LRWC on FB! I like the tree tote. Love the frog and apples! Follower of Modern Eden on FB too! I really like the flash cards. I just ‘liked” A Modern Eden on Facebook. I loooove the flashcards! Love them! My daughter would too! Apple bag would make a great teacher gift! Following A Modern Eden on Facebook. We love the frog print! I liked LRWC on FB! I also liked a Modern Eden on Facebook. Thanks again! I like the frog and apples.